I never liked her much, but it seemed like a good… learning opportunity for my almost 3 yr old. I am speaking of my chicken, Gertie. She died last night. It was not particularly tragic, but there was great need for verbal and emotional processing. From Isla anyway. And perhaps from me too. The “Part One” of this story can be read here. We found her this morning, as I expected, stiff and quite dead where we had left her. Although the “Part One” tells the touching tale of Dot, the caring Americana, who “stood” by Gertie’s death bed, supporting her physically and emotionally through her transition – the rest of the story was slightly less… touching. Last night I loaded Isla into the back on my back, covered her and me against the wet spring snowstorm, and sloshed out into the dark to “put the chickens to bed”. Of course, the goats now get first priority, especially as Bucky is still being bottle fed. But after the goats were tucked in, we headed to the coop to shut the girls and Little Willie up. And, of course, check on the “almost dead Gertie”. I expected another tender scene of flock devotion for the failing Queen. Instead we found Gertie at the bottom of the coop ramp laying the snow and mud, struggling on her side. Ouch. She was bleeding heavily from her comb. I could only imagine one of the other chickens, perhaps the “next in line”, pecking aggressively at her head as she lay helpless and dying on the floor of the coop. And perhaps Gertie struggled to escape, ending in a tumble out the door and down the ramp. It made us very sad. We raised the hatch on the “chicken condo”, the screwed on coop addition for our expanding flock, and took a look within. Perfect! Only Rosie, sweet Rosie Livingston Seagull Chicken. She was our first chicken and Gertie was our second. They were fast buds for an entire summer of camping in our yard. Rosie would not harm her. I picked up Gertie tenderly and laid her on the fresh, dry, wood shavings inside the condo, and even turned on the heat lamp. Her legs were already growing stiff. Rosie stood, shifted, and nestled back into the shavings beside her dying, old friend. I believed Gertie would be able to pass into the spirit world safely beside Rosie. I HAD to believe, or I would not sleep. Isla witnessed it all over my shoulder by the light of my headlamp – the Biggest Lesson of all – Life and Death and the harshness of Nature. Farm life never glosses over uncomfortable realities. Farm life never says “Oh it’s OK, they’ll just be happy up in Heaven watching over us.” Life and Death is never… “OK”, it just… IS. And as we lay in the dark warmth of our down comforter, the processing began. Isla is a BIG verbal processor. We talked and talked about Gertie and her spirit and how her spirit would leave her body behind. We discussed how she would not need her body anymore, and that her spirit would go to the spirit world and be free of her physical body and unencumbered. I told her I felt certain that she would be dead in the morning. We discussed the act of burial. And Isla made the obvious comparison to her own dead brother, Rowan. “Will Gertie’s spirit be with Rowan’s spirit Mama?” “That’s hard to say Sweetie. It’s possible. Chicken spirits and little boy spirits may not go to the same places. Would you like for Gertie and Rowan to be together?” She thought long and hard on that question, but the answer never came. She had finally, gratefully, fallen asleep. We sprinkled our handfuls of dirt over her rust colored feathers, the red clay nearly the same color as her body. Then I began a chant, dredged up from my short stint with Paganism, and as we stomped down the dirt we droned along… “We all come from the Goddess, and to Her we shall return, like a drop of rain, flowing to the ocean.” On and on we chanted and stomped as the newest snow flurry blew in around us from the north. And we continued to sing as we slopped back along the edge of the acequia, kept upright by the shared shovel. Green blades of grass poked up through the remaining clumps of snow, lining the path homeward. Our boots were 5 lbs each by the time we reached the coop again, pausing briefly to grab up the egg basket. These signs of rebirth, these cycles of life, were not lost on me…. spring snow, green grass poking through, eggs, and Easter less than a week away. Life and death are forever inseparable. Our compost pile rots all winter to give us fresh wormy dirt for our spring beds. Gertie will go back to the earth and the same red wigglers that once fed her, will feed on her, leading her slowly and steadily back to the Grand Mother of us all. 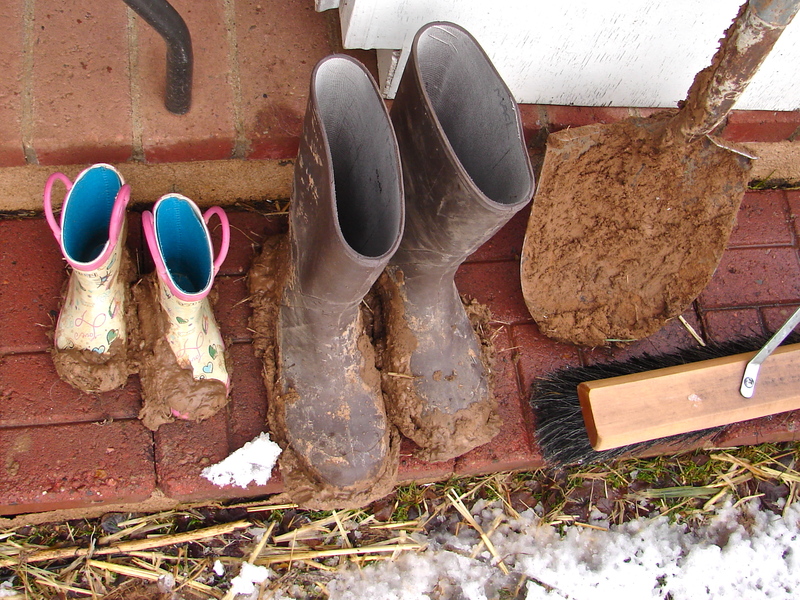 We sighed, leaned the shovel against the porch post, kicked off our boots and went back inside. again, as always, a wonderful essay! haha Rosie Livingston Seagull Chicken. I imagine her looking to the sky and wondering what it would be like to fly. Yep! She’s the one who even flew out of the chicken pen after having her wings clipped 3 TIMES! She’s determined.